A wrist fracture is a break in one or more of the bones in the wrist. 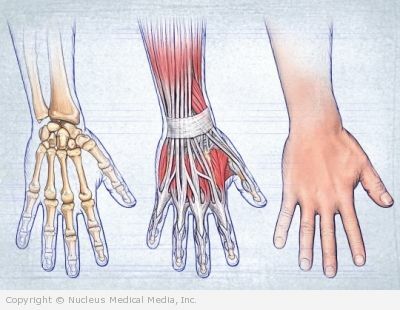 The wrist is made up of the two bones in the forearm (radius and ulna) and eight carpal bones. 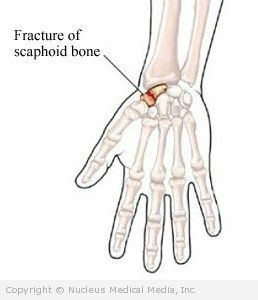 This fact sheet will focus on fractures of the carpal bones of the wrist. Wrist fractures of the radius, often called colle’s fracture, can be found on a separate sheet. Lateral epicondylitis is pain at the elbow. 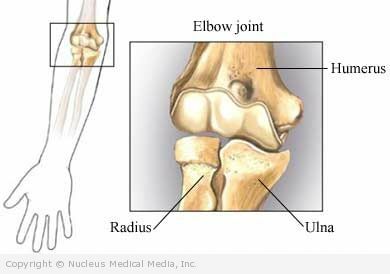 The pain occurs over the bone on the outside of the elbow. There are several muscles and tendons that attach on this area of the bone. A mallet finger happens when the extensor tendon to the distal joint of the finger is stretched or torn. The extensor tendon is on the top of the finger. The distal joint is the last joint near the tip of the finger. This injury sometimes includes a small fracture of the finger. Little League elbow is pain in the elbow joint due to repetitive throwing. This injury occurs in young baseball pitchers before puberty. Medial epicondylitis is pain over the bone on the inner side of the elbow. The piece of bone that can be felt on the inner side of the elbow is called the medial epicondyle. When the tendons attached to this bone are overstretched or torn, they can become painful. This is called tendinopathy.